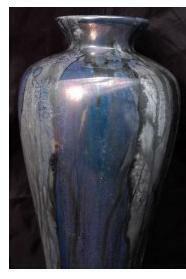 Stunningly beautiful Modernist Iridescent Luster Drip Glaze Porcelain Ceramic Vase. Of Earthenware clay, with gold and palladium lusters... 3 or 4 firings. 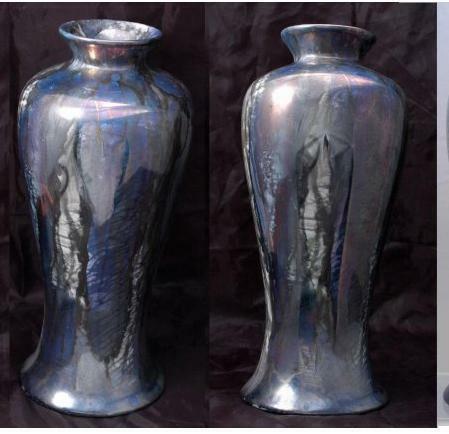 The colors are blue & silver that have a metallic sheen. 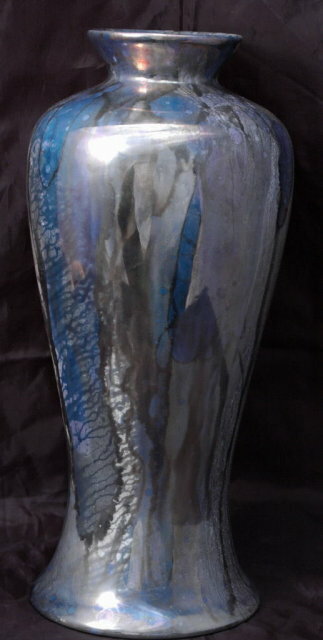 the vase is incredible with the inside fully glazed in white. The bottom is complete glazed over. There is no signature but it was made by Shannah Fain a noted ceramicist. She informed me that the vase was probably from around 1990 before she started signing her work. The condition is excellent. It is 11.5 inches tall. Check out our fabulously wonderful & wide variety of estate treasures. Items Similar To "Iridescent Luster Drip Glaze Vase, Earthenware Clay with gold an..."